Ricky, Alex, and David Resendiz with leader Steve Ford during the Monday night family dinner. 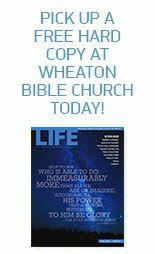 I first heard about the Caring for Kids and GriefShare programs at Wheaton Bible Church last spring. At that time, it was too soon, and we were going through so much that I couldn’t even think of attending. Besides, I thought I had everything covered. I can do this, I would tell myself. We’re doing just fine, the kids are so resilient, and I can be everything to them. Then it hit. My daughter began to experience extreme anxiety over my safety and was beginning to fear that something terrible could happen to me, too. Right about this time I was reminded that the fall session of Caring for Kids was about to begin. After the first few visits I noticed a huge change in my daughter. The companionship she found with other children going through loss seemed to be just what she needed—a gift from God to her and to our family. As we approach the year anniversary of my husband’s passing, our sense of loss is still profound and still hurts, but life feels more manageable. I am grateful that this program has given us a soft place to fall. Being part of these two programs—Caring for Kids (for my boys) and DivorceCare (for me)—has been an amazing experience for my newly separated family. Being new to the area—not having family or friends close by to lean on—has made this time even harder. Caring for Kids has helped us to confront some issues that I don’t feel I would have tackled so quickly nor with such ease had the kids not started the conversation first through their Caring for Kids group. This program has given my boys the freedom to have positive male role models who pray with them and teach them moral lessons in a fun atmosphere. DivorceCare has also given me the opportunity to sit with other parents experiencing the same issues. We still have a way to go, but I’m thankful that this program will be there again in the spring, being part of our lives as we continue to grow and redefine our newly different family. DivorceCare, GriefShare, Single Parenting groups for adults—along with Caring for Kids for their children—are serving more than 120 children and adults this year! We praise God for the remarkable growth in this ministry. Following a family supper, the adults and children go to their own groups for a time of learning, discussion, and encouraging support. New groups begin in January! Think about neighbors, coworkers, and others you know who could benefit from these groups or other support communities at WBC. This entry was posted on December 1, 2012 by Wheaton Bible Church in Winter 2012/2013 and tagged Caring for Kids, DivorceCare, family care, GriefShare, monday night, Single Parenting, support groups.